ALL PRION IMAGES: prion replication and spread at the cellular level. Prions are implicated in BSE (Bovine Spongiform Encephalopathy or Mad Cow Disease) and its human counterpart nvCJD (new variant Creutzfeldt Jakob Disease). These and similar diseases are known as TSEs (Transmissible Spongiform Encephalopathies). TSEs afflict other species, most famously sheep (scrapie). The image above is 600 pixels across and the original is 3,548 pixels across. Prions are pathogenic variants of proteins that are naturally produced in nerve cells and certain other cells. The normal "healthy" prions are referred to as PrPc (Prion Protein cellular). The word "prion" stands for "proteinaceous infectious particle" and so should properly only be applied to the pathogenic variants. In this picture, the production of PrPc is illustrated from the nucleus at bottom right. RNA that codes for PrPc is produced in the nucleus and exits via the nuclear pore. The RNA then passes along ribosomes attached to the rER. PrPc is formed in the rER and then progresses up through the Golgi. At the upper face of the Golgi, vesicles containing PrPc bud off and travel to the cell surface. Here, they fuse with the cell membrane and so discharge their cargo at "PrPc". By this means, the cellular proteins come to sit on the exterior of the cell. PrPc encounter rogue (purple) prions. These are termed PrPsc (sc stands for scrapie, the prion disease of sheep). The rogue prions seem to force the normal proteins to change shape. Both types of protein, the PrPc and their corresponding prions, are the same chemical - just different shapes. It is this shape-flipping which is equivalent to the transmission of infection. Such a conformational shift or flip could happen at the cell surface or in caveolae (one is shown as a small invagination in the cell membrane). Residual PrPc might continue to be flipped by contact with the rogue confomations for some time in these vesicles. Prions polymerise, finally appearing as purple fibrils in the picture at "P". PrPsc is resistant to degradation by the enzymes contained in the lysosomes that are seen floating nearby. Consequently, PrPsc accumulates in the cell. PrPsc vesicles may also travel to the Golgi and intercept PrPc that is being processed there. In this way, PrPc particles could be switched to the rogue form before they reach the surface of the cell. By such mechanisms, PrPc might be switched to PrPsc at various points in and on the cell. Prions could enter the brain along the axons of neurons. This probably happens by a retrograde flow of prion filled vesicles. These are shown in the picture as purple spheres ascending the axon like elevators going up a shaft . Another route of entry could be the blood, probably in immune cells. A lymphocyte is shown exiting the capillary at bottom left where it could then contact the astrocyte. 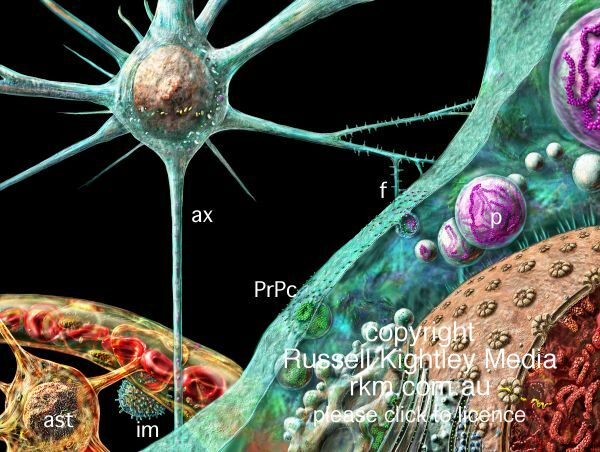 Astrocytes and other glial cells also support the production of prions.